Have you ever been caught in a rainstorm?Did the drops hit you one by one, or did you get wet quickly? 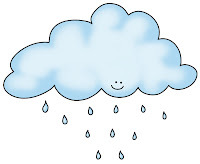 Our song from the CD Mi guitarrí: Spanish Songs for Kids is called “Gotas de diez en diez.” The English translation of the lyrics would be: Today, I see the sky and it’s going to rain. Now I see the drops, falling and falling. Ten, twenty, thirty, etc. The melody is catchy and your students will love to practice counting by tens as they try not to get wet!